COX’S BAZAR: Burning firewood desperately by the Rohingya people of Ukhia, Teknaf and Naikhangchhari will destroy the ecosystem of the Cox’s Bazar deeply, reports UNB. The local residents and environmentalists’ leaders expressed deep concern in this desperate deforestation which has made the green area grey and fad and asked the government to ensure everything before environmental disasters. “This huge number of Rohingya is almost burning 500 lakh kgs (estimated the figure) of firewood for cooking every day. They are mainly relying on the forest around the area of their camps. As a result, the forests are being destroyed every day,” forest department officials told UNB. 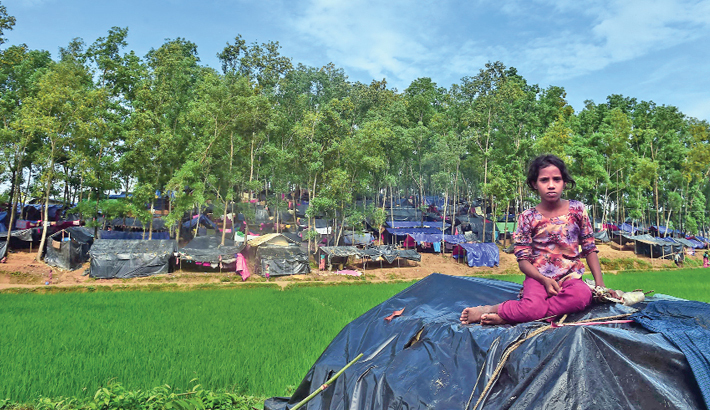 Jane Alam, a Rohingya living in the Balukhali camp, said “We cannot collect firewood due to rain earlier. Now we are collecting and burning firewood to the stove in the morning and evening which is being collected from the forest. There is no alternative to this cutting forest to collect firewood for cooking.”UNB also found that the trees and horticultural trees of the forest are burning in these stoves. Even they are regularly picking up the root of the trees which can cause mudslides. Some children were busy with the cutting of the root of the trees for their firewood, and many of them were collecting dry firewood from the deep forest. ‘No Man’s Land’ of Tambru (Ghumdhum Boarder area), Boro Chhakhola Para of Naikhangchhari, Phultoli and Ashartoli all presented the same the same picture. Mentioning the tragic incident of three Rohingya deaths in an attack by wild elephants in the hills of Ukhia, DFO Kabir said, “Everyone will have to think about it. Efforts should be taken to restore the damage to the hills and forests. Some individuals and organizations have distributed some kerosene stoves as the relief. But it is a little less than the requirement,” he added. Earlier, the relief and disaster management minister Mofazzal Hossain Chowdhury Maya also said on Thursday (5 October) had announced the allocation of 1,000 acres forest as the Kutupalong refugee camp in Ukhia of Cox’s Bazar will be expanded increased from 3,000 acres to build 1, 50,000 sheds by the government in total to accommodate the Rohingya people there. However, the highest rate of death for environmental pollution ion happens in Bangladesh, according to a new report published Friday (20 October) in the Lancet, a journal produced by The Lancet Commission on Pollution and Health. According to the report of the Refugee Relief and Rehabilitation Commission of Cox’s Bazar, some 604,000 Myanmar citizens were listed as of October 24 and the influx of the Myanmar nationals into Bangladesh from Rakhine State continues.